Product Details - Material- Non-toxic rubber, Use -engaged for hours while gently massaging the gums and keeping away the buildup of tartar on the teeth and Gently massages the gums Dimensions 30 cm, Suitable- All Breeds Dogs. Product Information - Made of premium rubber material to withstand even the toughest of chewers. 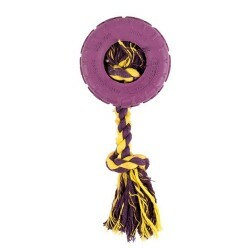 Non-toxic rubber material is safe on gums and teeth, Ideal for a game of fetch and tug, Suitable for all dogs.